ATLANTA -- Cancer treatment aside, Jimmy Carter is keeping busy. 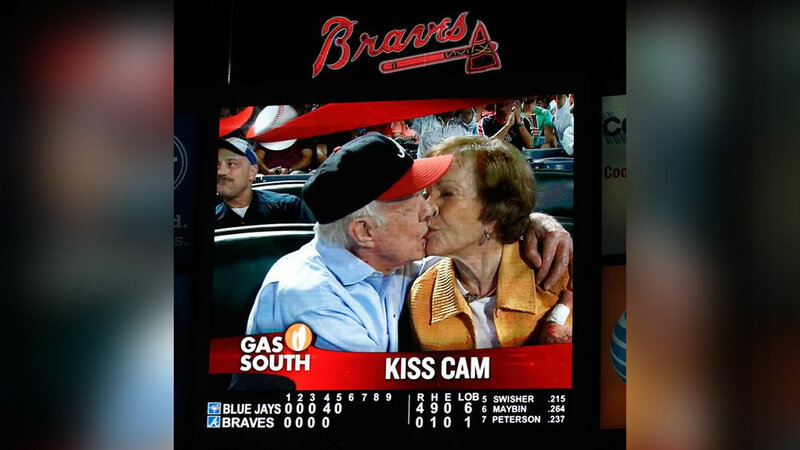 Thursday night, the Atlanta Braves tweeted a picture of the former president smooching with wife Rosalynn on their stadium "Kiss Cam". On Wednesday, Carter took questions from students at Emory University in Atlanta during the 34th town hall he has led. He is a distinguished professor at the school, and the human rights organization he founded also is an affiliate of the school. Carter said last month that he would scale back work at The Carter Center to focus on treating cancer that has spread to his brain. In the month since, previously routine events for the former president have taken on new meaning. Student questions during Wednesday night's lively town hall covered global issues, the 2016 presidential election and Carter's relationship with his wife of 69 years. Carter says the couple plan to go fly-fishing this weekend in north Georgia.